It’s annual must-see tv for millions of pet lovers across the country–the Puppy Bowl on the Animal Planet channel on Super Bowl Sunday. 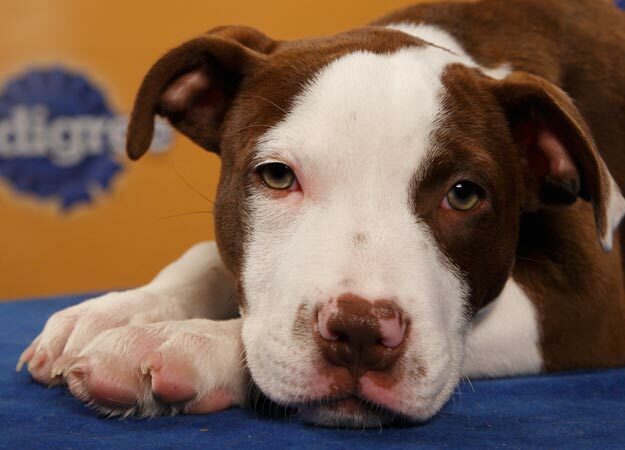 This year, Puppy Bowl VIII is Sunday, Feb. 5, at 3:00 p.m ET. The starting lineup features 20 puppies from rescue organizations and shelters around the country. Pictured is Lucie, an 11-week-old Pit Bull/Collie mix from the Pennsylvania SPCA. Check out these adorable behind-the-scenes pictures with some pooped pups. Also on the show this year are kittens, pigs and hamsters in various roles as cheerleaders, halftime entertainers and aerial view blimp pilots. Meep the bird will be live tweeting the action. If you’re going to a Super Bowl party, make sure to set your DVR to record two hours of mindless feel-good entertainment. Where else do you get to see a whole bunch of puppies wrestling, chasing and having a blast just being cute?